ww2dbaseIndianapolis was commissioned during the peaceful interwar years, patrolling the Atlantic and Pacific oceans. She was Franklin Roosevelt's personal transport on several occasions, including a trip to South America in Nov-Dec 1936. She enjoyed various flagship status for the bulk of her peacetime career. When the Japanese attacked Pearl Harbor, she was conducting a bombardment training off Johnston Island. She was sent on a hunt for the withdrawing Japanese carrier force, but failed to locate it. ww2dbaseIndianapolis operated with carrier task forces in the Pacific during WW2 until 1942, then she was transferred to Alaska. In Jan 1943 she participated in the operation to occupy Amchitka and establish a forward base in the north Pacific; in this operation, on 19 Feb 1943, she came in contact with the Japanese transport Akagane Maru, and sank the ship. She later assisted in the operations to reclaim Attu and Kiska. ww2dbaseAfter a refitting at Mare Island, Indianapolis was transferred to Hawaii where she was boarded by Vice Admiral Raymond Spruance, becoming the flagship of the Fifth Fleet. In this role, she was a part of the main assault force during the Gilberts operations. She also participated in virtually every operation across the Pacific toward Japan, including the credit of downing Japanese planes during the "Great Turkey Shoot" off the Marianas and being the first ship to enter the Apra Harbor at Guam since being conquered by the Japanese in Dec 1941. Her 8" guns were also vital in preparation for the famed landing operations at Iwo Jima and Okinawa. "All bodies were in extremely bad condition and had been dead for an estimated 4 or 5 days. Some had life jackets and life belts, most had nothing.... About half of the bodies were shark-bitten, some to such a degree that they more nearly resembled skeletons. From one to four sharks were attacking a body not more than fifty yards from the ship, and continued to do so until driven off by rifle fire." ww2dbaseIndianapolis' commander, Captain Charles Butler McVay III, was the only man in American naval history to be court martialed for losing a ship during wartime. He was convicted of "hazarding his ship by failing to zigzag", a practice that was detailed in American naval doctrine as a guard against submarine attacks (though known to be ineffective by both Japanese and American submarine commanders). McVay was exonerated in Oct 2000.
ww2dbaseSources: In Harm's Way, Naval Historical Center, Wikipedia. 15 Nov 1932 Indianapolis was commissioned into service. 18 Dec 1941 American cruiser Indianapolis returned to Pearl Harbor after failing to find the Japanese carrier fleet. 16 Jul 1945 The cruiser USS Indianapolis sailed from San Francisco, California, United States with a top secret cargo - components of the atomic bomb to be dropped on Hiroshima unless the Japanese surrendered. 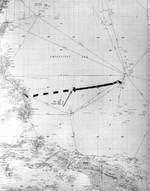 The Indianapolis would take 10 days to sail to the island of Tinian, Mariana Islands where US B-29 bombers were waiting. 26 Jul 1945 USS Indianapolis delivered components of the atomic bomb "Little Boy" to Tinian, Mariana Islands. 29 Jul 1945 Japanese submarine I-58 sank cruiser USS Indianapolis; USS Indianapolis' prior order to maintain radio silence resulted in a 2-day delay in realization of her loss. 2 Aug 1945 A number of survivors of cruiser USS Indianapolis, which was sunk 4 days prior, were found. I have been asking and looking on the web for the final resting place of this mighty ship. Has it been found? and is their pictures of it?I had an uncle in world war 2.He was on two destroyers that was shot out from under him.How can I find his ships and history of ww2. Where could I see photos of the survivors in re-unions or sometime afterward? the last i heard was a documentary about a year or so ago on one of the history channels. several of the serviers went with a reaserct team to try to locate the final resting place but were not sucessful. I have not seen or heard anything more. I too would likt to know more about this. The USS Indianapolis means a lot to me. It played a big part in helping to end that war that I was born into! Indianoplis had 10 Bronze Stars,you do not get Stars for assisted Campaigns only for Battles, It had 2 Iwo Jima and Okinawa. I was at Iwo Jima. Hi, David Mr Chen's story and yours do not match.Your are telling me one thing and he is saying some thing else. I have 8 Bronze Stars Short one Marshall Islands I was not aboard the Bronson,my first one was the Battle of Siapan I was on the look out when they raised the Flag on Iwo Jima. I may get the 9th one for re- capture of Midway.Are ship made a sollow run on Japan to Northen Honcho,then came home for re-pairs at Mar Island, Calif. If I made a mis- take I apologize on the Indianapolis it was a great ship.When it got hit are ship was at Guam with the fleet from re-pairs when President Truman said the war is over.Thanks to all the men and women served in W W I I, I have the American Flag hanging in front of the House. Does anyone know where (or if) online ship rosters for the Indianapolis can be found for crew members 1943 and/or 1944? To Anonymous Comment #12: US Navy WWII Muster Rolls are available online at Fold3.com but it is important to keep two things in mind about that. First, Muster Rolls were created monthly but only accounted for members of the enlisted crew. Officers were also accounted for monthly but in the Deck Logs, an entirely different set of documents that are not available online so far as I know. Secondly, Fold3.com is a subscription site that will require payment to access the Muster Rolls. If either of these documents is available elsewhere online, I am not aware of it. However, both the Muster Rolls and the Deck Logs are available in hardcopy from the National Archives (archives.gov) either free of charge or for a nominal copying fee. Unfortunately, obtaining records from the Archives is not a swift process, certainly as compared to the internet, but it is reliable. The first to spot the Indianapolis survivors in the water was LT-jg Wilbur Gwinn on 2 Aug 1945 flying a PV-1 Ventura with VPB-152 out of Peleliu (unknown aircraft BuNo). The first PBY Catalina to land among the survivors was piloted by Lt Adrian Marks of VPB-23 also out of Peleliu (PBY-5A BuNo 46472). This plane landed on the water but did not take off again, instead it was scuttled the following day. The first surface vessel to arrive (night of 2 Aug 1945) was USS Cecil J. Doyle (DD-368) commanded by LCdr W. Graham Clayton (later Secretary of the Navy and Deputy Secretary of Defense). The core was most likely delivered on another ship named the USS ALCOR. For reason right now I cannot mention, the background on some of those denotes this. Also the hidden in plain sight identification without the need of communication used by the Black Chamber also indicates a dual safety of fear of any form of loss, detonation and security. Mr. McLucas (Comment #15): I gather the “core” you mentioned refers to the core for the atomic bomb. I am not sure when the Alcor could have done this. According to the ship’s War Diary, it never got anywhere near the Marianas at any time from 1 May 1945 to after both bombs had dropped. Look at its history, placement, ships it repaired and came in contact with within the envelope. It was much slower than the Indy so it left earlier or some form to meet the gadget on time. We only had enough enriched material for two or three ordinances. Splitting the load was very very possible.If it was carrying what I suspect, it was handed off in route to and with a specialist with baggage. I would search the logs for an officer transfer. I don't think everything was in naval logs although the ships logs were most likely very accurate, there were very bad feelings about the gadget being used at all as a ordinance. Look what happened to McVay after. I may be wrong but what my hypothesis steers me to is to the ALCOR. Please prove me wrong, I need the input. Thanks. What was the actual crew number for this ship? It says 621 in the specifications at the top of the page, but says 900 in the fourth paragraph. Whic is correct?